▷ Best Partial vs full highlights 2019 ¡Photo ideas & step by step! There you are tired of how your hair looks or maybe just wanting to change the way it looks and you have decided the change of look you are looking for are highlights and you start looking online what kind of highlights you want and find yourself with the question: Partial or full highlights? What is the difference between these two anyways? All you really know is that you want your highlights to make everyone jealous of your amazing look, the technical thing you should leave to the professionals, right? Well, you are right, a good hair stylist is not only supposed to guide your decision with their experience, but they should also help you know and understand what is the difference to help you decide what highlights you should have on your hair and what will fit your budget. 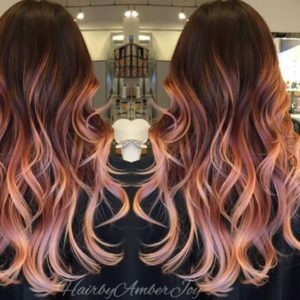 The truth is that, at the end, you are the one that decides what goes on your hair regardless of what your stylists will say, in the next lines of this article we are going to help you know what is the difference between full and partial highlights so you have enough information to take the decision for yourself and look amazing with it. Partial highlights are commonly placed in certain parts of your hair, like for example around your face, to brighten up you face and hair color and to accentuate your features. 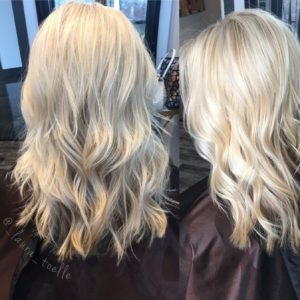 These highlights are a low maintenance option meaning you will not have to go to the salon every so often to retouch them and that if you get tired of them you can easily grow them out or cover them. Partial highlights are subtle, so if you are looking for a little change they are the ones for you, and can be only around the hair strands around your face or distributed throughout the whole head. Together with your stylist you will decide what parts of your hair are going to be treated with bleach and which ones are not. Partial highlights are usually placed on two different parts of your head, they are either on the top half of your head or at the top and side sections of your hair. It really is up to you and your stylists. Not only you can apply them to certain strands of hair, but you also can apply them to half of your hair in an ombré or balayage way known also as “half head highlights”. 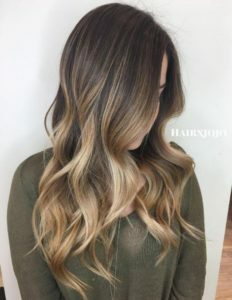 These people experiment a little with the partial highlights and place them on the tips of their hair, most of the times with a balayage or ombré look as mentioned before, and others go a little crazier and end up applying color on top of an old discoloration. 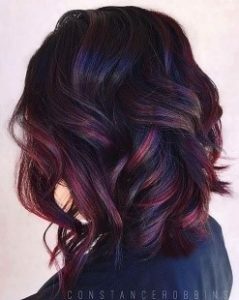 Full highlights, on the other hand, are placed all over the head creating a dramatic change, and while you are not dyeing your head completely you are applying more color and even lights through your hair. Most of the times full highlights will give you a new color maintaining a bit of your old color to add some contrast and dimension. Also known as “Full head of highlights” the process takes some time as it has to dye the totality of the head from the front, the side and all over to the back, even the nape of the neck. 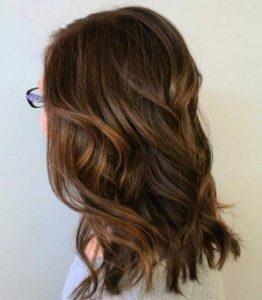 This type of highlights can be very heavy allowing for a person with natural hair to drastically lighten their hair, for example a natural brunette can become a beach blonde or the can only lighten your hair slightly. 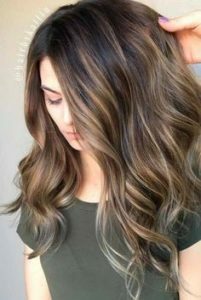 The thing with full highlights is that they do need a higher maintenance, so what most of the people with full highlights do is to vary between full and partial highlights to lighten the amount of money they have to spend as the highlights in the lower parts of the head do not really need so much care. 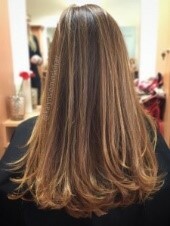 What is the difference between full highlights and partial highlights? 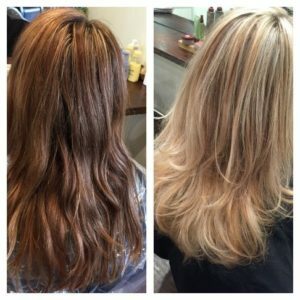 The main difference between partial and full highlights lays in how much of your hair they are covering, with full highlights your stylist will look and add more highlights throughout your whole head and hair. On the other hand, with partial highlights they are added to partial parts and certain sections of your hair, the areas your hair stylist chooses to apply the highlights on will depend on the type of look that you are trying to achieve. With partial highlights you have a little more freedom and options at the time of applying them to your hair as you can place them on the top layer of your hair, or maybe to the front sections. You can also add them just on the top strands of the hair or add few ones to the deeper parts to add some depth and dimension. Full highlights need a higher range of maintenance as they are applied to the whole hair this includes applying them to the roots, which will lead for you to need more retouched and do’s to your hair to keep it nice and clear without any root growth. On the contrary, partial highlights will need less maintenance as they are applied to less pats of the hair and can also be applied only to one half of the hair avoiding completely the need of retouching. If you do not know which one to choose for you, do not worry if you are not understanding which one would work best for you, when in doubt ask your hair stylist to clarify all the doubts and questions you have for guidance. Most stylist are completely open to a full consultation with space to make any changes and adjustments on the day of your appointment. Always keep in mind that pictures speak more than a thousand words and showing your stylist ideas of highlights that you have seen and liked on the internet so they can help you further to determine which ones are best for you. 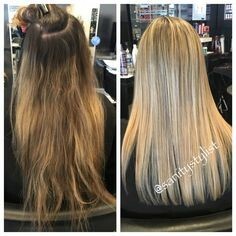 The trick here is making sure you know what you really want, if what you want is a subtler change of look then partial highlights are perfect for your as they are going to just highlight a few strands to add more lights and depth to your hair without such a big change. Now, if what you are looking for is a bolder and more notorious look then full highlights are the ones for you. 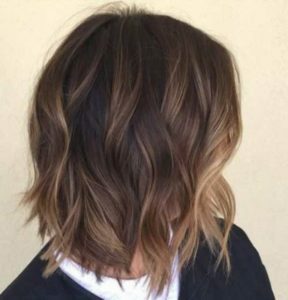 They will give you a bigger change of look than partial highlights as they are going to change the overall look of your hair but without completely dyeing it, adding definition, depth and movement to the hair. Golden Beachy Waves: Partial blonde highlights are a great addition to wavy hair to make it have a ton of dimension. 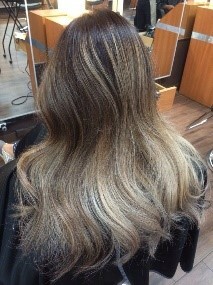 The partial highlights shown in the picture are added just to the top layers of the hair and evenly all over it leaving the darkness of the root show to make a contrast between these two colors. 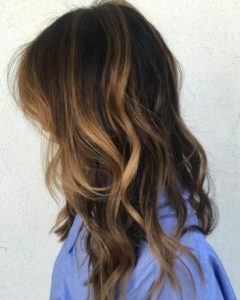 Cool toned balayage: This technique can give you a seamless transition to the dyed hair that becomes heavier towards the ends of the hair. This can add a ‘live in’ look that is the easiest to maintain, and if you add a bit of toner and play with layers you end up with a cool toned job that is perfect for any time of the year. 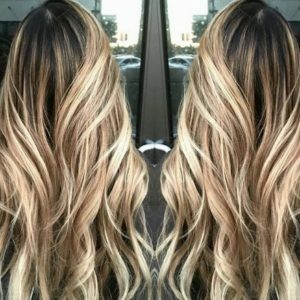 Natural tones: Adding highlights that are just a few shades lighter that your hair can make a wild difference with it as is can make your hair pop, and the most fun part is that your hair may seem normal while being inside but once you step out into the direct sunlight you can watch your hair come to life! Partial red balayage: you can also use accent highlights to add a vibrant color to your hair. Using the hand painting technique or some partial highlights you can add a pop of color that can be both trendy and interesting. To try new colors without damaging your hair too much use this technique and red is a color that can be used for any skin and hair tone if you find the correct shade. 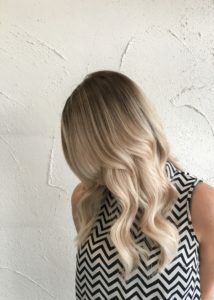 Subtle blonde: Subtle blonde partial highlights are full of spirit, it will add lots of movement, relaxed waves and adding the subtle blonde highlights to peak through, it is a winner. 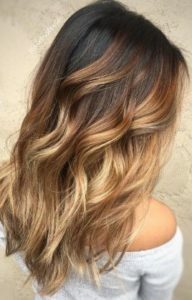 The blonde highlights will reflect the light within every wave and will add dimension and depth to your hair style no matter what. Front framing pieces of highlighted hair: Partial highlights can also be as playful as you want and the do not have to be distributed around the totality of the hair if you don’t want them to. Adding this face framing pieces can brighten up your complexion without changing your overall hair look. Icy blonde all over: Using very thin lights (Also known as baby lights) all over your mane can give you an icy blonde look. This color together with the length and feminine curls will with your hair lots of light and life. And by keeping the root adds a lived in vibe that can translate to fewer touch ups in the future. Multi-dimensional highlights: When done rights, full highlights from top to bottom can end up in a breathtaking outcome. Perfect for straight, sleek hair and ideal for anyone who wants a classic look, it is recommended you give this look a try. 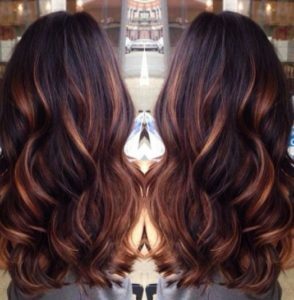 Full blend of color: Why not have fun with your full highlights? Using them to add multiple colors to your lovely locks is a great idea. Use it for a fun blend. Show some colors to your colorist so you can inspire them to liven up your beautiful mane. 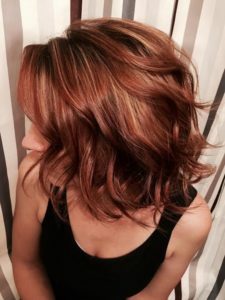 Add warmth with auburn red: Do not close yourself up to only blonde highlights, you have such a wide palette of colors that sticking just to one may even sound sad. Make your way for red warmth by adding blonde and caramel colors. Full highlights can help you go warmer but without having to dye your hair red from root to tips. This way it can look much less crazy and easier to manage. Classic all over blonde: If you have ever wanted to go for a blonde look but have not have the guts to do it? Now is the time! Without bleaching all of your hair, you can go through a couple rounds of highlights to gradually get to the blonde you have always wanted. Keep the color even all over this fresh looking blonde or add different shades to make it have more movement. Brunette to blonde: With dreamy tones and perfect transition from brown to blonde, what is there not to love? 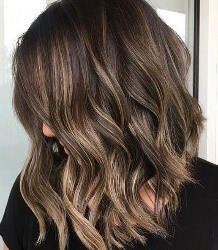 Using fewer and more separated highlights that are farther away from the roots in a balayage like technique can make it look even better. 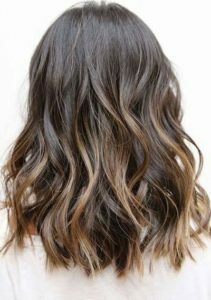 All over with layers: Going with thin highlights all over your hair can soften the blonde and brunette alike if you can find the color just right for you, making your hair look lights and healthy.